I am so inspired by Chris “MACCA” McCormack. He is such a incredible athlete. I have always said I would never do Ironman but after watching this never say never…. The past three weeks I have really enjoyed getting out and running again with all my friends. I have joined Shauna on a few early morning steady runs. Shauna is gearing up to run Sacramento Marathon in December. She has been training hard and I am so excited for her to race a great Marathon! Last week I did my first workout since the marathon. I met Mark (Sparky) and we warmed up to Kits point where we did 10 x 2′ with 1′ rests. We did a loop part on flat trail and part on grass. It was a lot of fun even though I was feeling a little rusty:) This morning was a relaxed 90′ with Kevin, Shauna and Claire Jean. It was nice to see Claire she was in Vancouver after racing a cross country race in Seattle. Poor Kevin 90′ of girl chatter Ha! 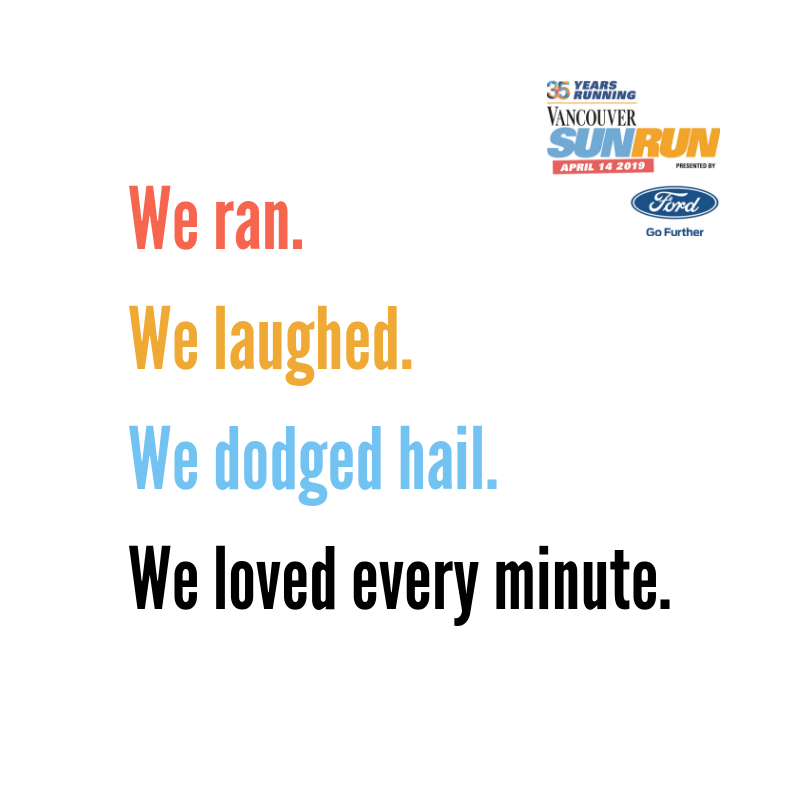 Come out to Stanley Park and cheer on all the runners this Sunday at the James Cunningham Seawall Race. A Interview From Chris McCormack’s website I found interesting! Very much by feel. Fatigue is something you know you are suffering and over the years I have been able to become very honest with myself and know when I am being just plane lazy or when my body is screaming out for rest. I think this honestly has been the primary reason for my longevity in career. By knowing what your body needs and then understanding how it responds, you get to, slowly over time, get a feel for your body rhythms and determine when you are starting to push the envelop too much. This becomes critical as you age as your body does not recover as quickly as it did when it were younger. Being confident enough to let it go and say, that is enough for today, and then not question that decision is the key. Guilt is what can hurt you more if you can’t learn to have this ability to say enough is enough when your training. So giving you an exact criteria s difficult. I guess the signs are pretty obvious when you have done too much. Heavy legs, body aches and sleep issues, lost appetite etc, but this being said just because you suffer anyone of these symptoms doesn’t mean you immediately call off the training. Training is about testing your body, allowing it to recover and then doing it again. It is a fine line we walk and for this reason your own body awareness is key. You can suffer any one of these symptoms and continue to train hard and many times I do. It is just being aware when enough is enough and for me it is totally a feel. My body then does not want to respond to sessions and I am super fatigued. What does the feeling of heavy legs mean to you? Do you change anything in your actual training? It means many things. It means I have done a lot of work, it means I am on track and it can also mean that I may need to rest. It is a very broad comment this, heavy legs because as a triathlete you can have heavy legs for many reasons. I usually assess just how fatigued and heavy the legs are and if it is for a prolonged period of time I start to really reduce my workload and pile on the recovery. Your training volumes are reduced and more so the intensity of your workloads are reduced. I begin to focus on more active recovery workloads until I feel that the body is returning to a level where we can work out hard again. Now a period of heavy legs if it lasts more than 5 days, then you start to make this dramatic adjustments. If it is only lasting for 1 or two days then this can often be considered as normal for the type of workloads we are enduring. Ironman and endurance athletes are pushing the envelop of training all the time, and the difference between the good athletes and the great athletes is this body awareness I believe. Being able to make calls on just when you have done too much and then make the adjustments to rectify the issue so you can continue to push on. When was the last time you experienced heavy legs or a drop in performance despite a good training blog? It has been a while primarily because I tend to err on the side of cautious training as I have moved into my late 30’s. I am a much more confident athlete now when it comes to training plans and volumes and just what needs to be done and what I can handle. I always err on the side of less now primarily because I have noticed that my recovery is a lot slower than it was when i was in my 20’s. You need to be confident enough to be able to let go of your set training parameters that you have drawn up from years of training and realize that you can’t always replicate exactly what you did when you were 25. You can still do it, you just need to make sure that the workloads either side of your big sessions are adjusted so you can absorb that work. I think for this reason I have been able to really control my performances and remain injury free which is key. The last time I think I honestly blew my training and completely overtrained was in 2003 preparing for the Ironman. I got married in August and left myself very little room for preparation for the race. I really pushed the envelop of training and did some incredible workloads. I then when I came time to taper my body was simply cooked and the drop in volume just shut my body down. I was totally destroyed that year. I did 12 weeks training in 7 weeks. I look back now and shake my head but I can see how people get caught up in a system of too much and not pay attention to the signs. It is fear and panic that pushes people here and you fail to look around and slow down and assess when you are driven by these two emotions. What was your initial thought – did you recognize it as overtraining right away? No, I did not realize it was overtraining until it was too late. I think you have this perception that you are doing a lot, but as Endurance athletes we border crazy training volumes anyway, so putting a point on what is too much or not enough is the hardest thing. I think I knew I had cooked myself when halfway through my taper all I wanted to do was sleep. My body was not responding to the rest and I was not bouncing back and starting to feel fresher, I was actually really starting to feel worse. It is normal to feel a little lethargic in a taper but after 5 or 7 days this starts to go away and your body really starts to feel healthy and pumped again. In 2003 I never had this feeling at all. I started to feel better sure, but my desire to sleep was huge, my appetite really never returned which was strange and an immediate indicator for me that things were not right. It was too much to quickly and the body being resilient will try and hold together but when it breaks it breaks hard and it is too late. It did my season. I took off after Kona until early december and did nothing. I really tried to give my body a solid rest. I always worry about the heart muscle and try to give the heart a break from those high intensive workloads that we put it under when we are training hard. The heart can fatigue I am sure of it, and I always really focus on end of season on giving my heart a rest from those types of exercise that elevate it too much. I try to do yoga and softer stuff like surfing just to keep the body in good shape but give my heart a break. In 2003 I gave my body a solid rest and didn’t start to get into any structured workloads until the new year. From mid October until December 31. Thats a big break and my body was happy for it. Did you feel any difference in performance after allowing sufficient recovery? Of course, coming back from prolonged periods of rest is always difficult because building your fitness base again is tough. When I rest I seriously rest properly. I don’t do much aerobic work at all, so I take my time into building my fitness. I was doing an Ironman in early April and dominated this event so I guess I can say that the recovery was great for my body and the comeback after this was very solid. I had a very impressive year in 2004, so things went well post this 2003 training mistake. How and what nutrition to you use to support recovery in such a case? I am naturally an 85kg man. My body tends to move very quickly to this weight when I have a break. I race at 77kg which is as light as I can get without breaking down. I honestly think the body does not like to run this light for long periods of time and giving your body a chance to sit at this proper weight for a period of the year is important. When I take a break I try to let my body gravitate back to its natural weight, but I eat very well so it is my natural weight. I am not caught up in this weight focus that I have to be as a larger athlete racing these endurance events. Sport Scientists told me I was too big to ever race Ironman events. I was a power athlete and the Ironman races were built for the smaller athlete. Well, now I have won more Ironman races than any other male and won the World Championships when they said it would never be possible. I did this through closely watching my nutrition during a season and understanding my body’s weight limitations when it comes to training workloads and strength. As for supplements the key for me is supporting my immune system to allow me to do the volumes I require and slowly bring my weight down without getting sick. The only product I use is Biestmilch and that is the truth. The rest of the time I eat very well, I enjoy a very Mediterranean palate and extra spicy foods especially chillies. When ever I am looking at recovery I am focused on eating well, hydrating well and balancing my diet.